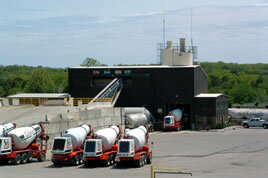 A new 400-ton per hour Gencor Industries asphalt plant was permitted for P. A. Landers in Plymouth, adjacent to Massachusetts Route 3. Tech Environmental assisted in the preparation of a Non-Major Comprehensive Plan Approval application, filed as part of the air quality approval process. Tech also completed a noise measurement program to measure baseline conditions for this project. A BACT analysis and emission calculations were also performed. Manufacturer's data for particulate matter, nitrogen oxides, carbon monoxide, and volatile organic compounds were used to calculate emissions. Tech Environmental completed extensive dispersion modeling, wind data analysis, and health risk assessment tasks for two public hearings before the Zoning Board of Appeals. Tech scientists presented expert testimony at these hearings. P.A. Landers required extensive dispersion modeling and expert assistance to permit a 400-ton-per-hour asphalt plant. Tech provided comprehensive permitting assistance through noise measurement, BACT analysis, dispersion modeling, and health risk assessment.